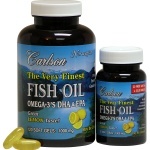 June 17, 2011 — Carlson Laboratories announced recently the donation of approximately 200 bottles of fish oil to support tornado relief in Joplin, Mo. The donation will go to Suzanne’s Natural Foods in Joplin, where staff have been providing free meals for local residents who have been affected by the natural disaster. “Our hearts go out to those affected by this tragedy, and we want to help in any way we can,” said Carilyn Anderson, president of Carlson Laboratories. The tornado, which struck the Missouri town May 22, claimed the lives of more than 130 people and nearly demolished the area.